Look Out! It’s a Kaiju Attack! Well, we were warned! Earlier today we heard a test of the Kaiju Emergency Alert System, but apparently that was not enough to save the city of San Francisco from the wrath of a 300-foot tall creature with a taste for national landmarks! Obviously, for my money, this is a better teaser for Pacific Rim than the earlier test clip, because it is much more exciting. While the “found footage” effect is normally jarring, I think it’s acceptable here because it is a short clip, and the shaky, broken-up images convey a sense of confusion and fear. However, if the entirety of Pacific Rim is shot in this fashion, I will not be pleased. I could not stand another entire feature of vibrating picture frames, snow and blackouts along with blown-out sound. But I trust Guillermo del Toro to deliver a film, not just a gimmick movie. Pacific Rim Warning: Film Will Stomp Your Guts Out! I know there is more to science fiction and fantasy than DOCTOR WHO, so let’s spend today looking over some interesting photos from the Hawaiian set where they are filming the forthcoming movie The Hunger Games: Catching Fire. Here we have a bunch of images of Jennifer Lawrence as Hotness Katniss Everdeen, Sam Claflin as Finnick and Lynn Cohan as Maggs. As you can see, some shots are from the beginning of the Quarter Quell, and some appear to be later action. Check out Maggs with Finnick’s trident and Finnick with Katniss’ bow! I really like the design of the combat suits; I think they’re better than the costumes in The Hunger Games. The Hunger Games: Catching Fire opens Nov. 22, 2013. With excitement (and hype) building for the DOCTOR WHO Christmas Special, let’s see what one of the best writers in the world thinks about the Doctor’s new assistant! We all know that Neil “I’ve won almost every award under the sun” Gaiman has scripted the 12th episode of the current season, “The Last Cyberman,” but you may not have realized that back when he was actually penning the script, he was writing for a new companion that had not even been cast yet. So how did he do it? Ah, so that’s the secret: Get the scoop directly from the character’s creator. 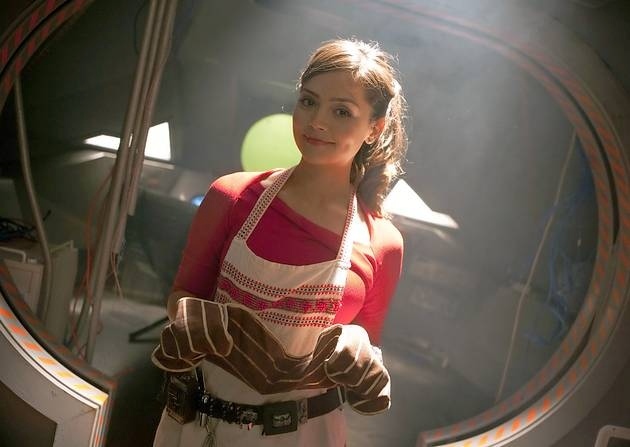 So, what sort of character is Jenna-Louise Coleman‘s Clara? How does she differ from other recent assistants? 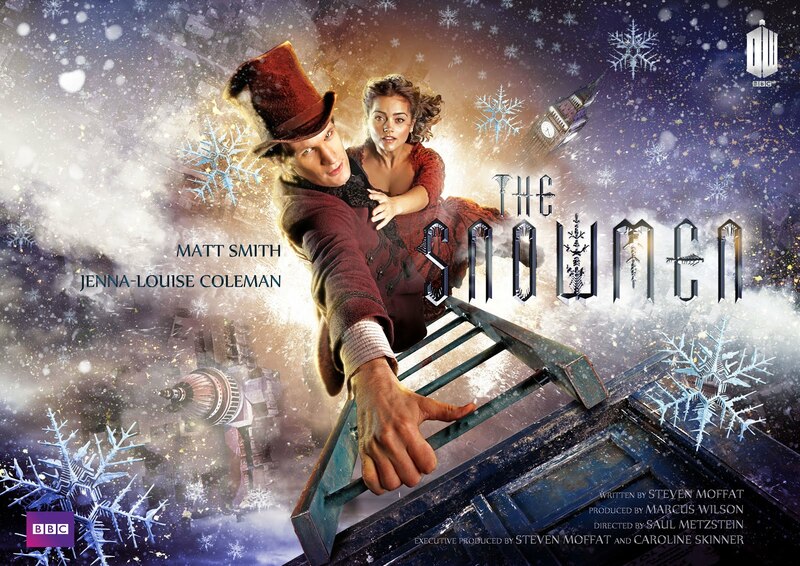 I like several aspects of this design — not least of which is Jenna-Louise Coleman’s artfully concealed cleavage — including the heroic Doctor wearing a new hat, the sense of height and the tiny teeth in the snowflakes, but I don’t fancy the distinct lack of… well, snowmen. What’s up with that? Don’t expect much from this, the first teaser for season three of the amazing GAME OF THRONES on HBO. The premiere is not until March 31, so obviously it’s not going to spoil anything yet. The official HBO GoT site might help take the edge off until spring. This week Rick was hounded by phone calls from beyond the grave, and Michonne was hounded by Merle; in other words, both of them were trying to escape from their pasts. But ultimately they both had to turn and fight, Rick with words and Michonne with her katana. Although the episode was divided, this was Andrew Lincoln’s Emmy reel. This is doubtless the episode he will submit in the academy. Rick went bye-bye, and Lincoln said hello to a meaty script that gave him a chance to demonstrate that he can play more than the stoic leader burdened by command. 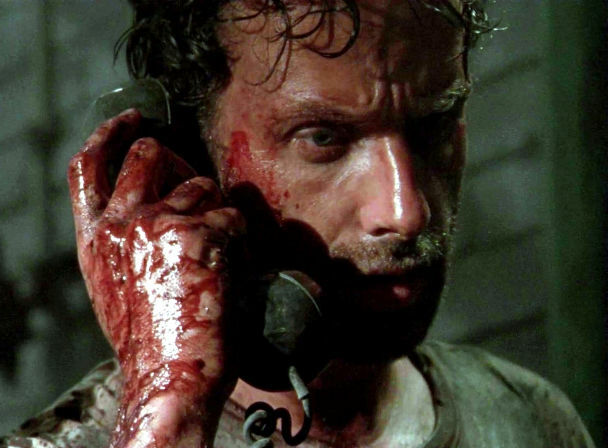 In the comics, the phone conversations were how Rick worked through his grief over the death of Lori and their baby, and while the circumstances are quite different on the TV show, the calls served the same purpose here: Rick has a conversation with his conscience, and tries to figure out how to carry on in the face of his failure to protect everyone all the time.